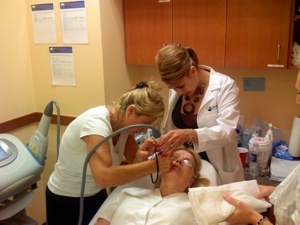 Among today’s career opportunities, few are as exciting as that of a cosmetic laser technician. There’s no doubt cosmetic laser technicians are in demand. People everywhere want to look younger and improve their appearances. As a cosmetic laser technician, you can help them make this happen. The American Society for Aesthetic Plastic Surgery reported that in 2013, laser hair removal, photo rejuvenation, and microdermabrasion were 3 of the top 5 nonsurgical cosmetic services performed last year. These treatments make up the 10 billion dollar marketplace of medical aesthetics. Because more clients are seeking out longer-lasting and more permanent results, more people are becoming trained with these advanced laser technologies. The opportunities for a cosmetic laser technician are vast. You could be employed in a salon or clinical spa. You could rent space in one of these locations and be self-employed. You could even open up your own practice. There were millions of cosmetic laser procedures performed last year alone, and the potential to do extremely well in this business is very real. You can become a certified cosmetic laser technician with as little as two weeks of training. The best cosmetic laser training in the industry is offered at National Laser Institute, located in both Arizona and Texas. We are the oldest and largest cosmetic laser training school in the country with over a decade of educational excellence, and we were the first to pioneer the cosmetic laser training curriculum. The state of the art training you will receive here is second to none. We combine classroom training with hands-on lab work on real clients to give you the experience you need to be successful. Our cosmetic laser training courses cover everything from laser safety, the Fitzpatrick scale, biophysics, equipment functionalities, client selection, tissue interaction, laser techniques, pre and post care treatments, and much more. After two weeks of our training, you will have all the knowledge and skills to obtain a career as a cosmetic laser technician. We offer our graduates access to our Graduate Services Department, which provides graduates with 100-200 job leads each month as well as answers any questions or concerns that arise at any time. We’re dedicated to you as both a student and a graduate. Contact National Laser Institute today at 1-800-982-6817 or fill out the form on the right for further information. If you are qualified, you could receive 100 percent financing for your training with us, including travel and hotel expenses. Take that first step toward your new career by calling today. National Laser Institute now offers night classes for those whose schedule won’t allow them to attend our two-week comprehensive laser training course. Night classes are offered Monday – Friday from 6pm – 10pm. Act fast, as these classes do fill up quickly!